When it comes to pronunciation, Japanese is relatively simple. What you see is what you get. Unlike some of its neighbours, you do not have to worry much about tones or multiple ways of saying a vowel (looking at you english). For those who have also studied Spanish, vowels are similar. As for consonants there is relatively few compared to English, and for the most part are pronounced the same. Again, when spoken, each consonant is followed by a vowel either a,i,u,e, or o; with the exception of the singular “-n”. 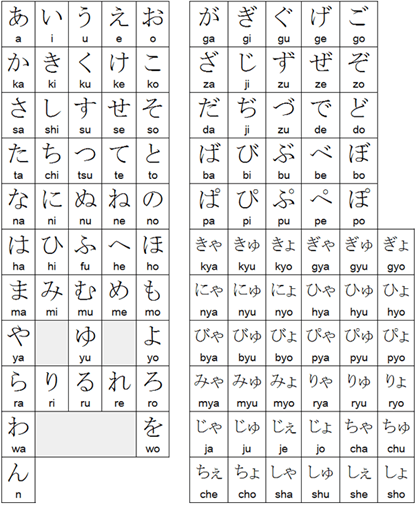 Here you can see the sounds of the Japanese language. Here is a video made by a Taiwanese Youtuber singing about the sounds of the Japanese language and basic phrases, enjoy! *When Japanese is written the character “は/ha” is used as a particle, it is read as “wa” and not “ha”. Yes, there is a character for wa “わ” but it is not used in this case. * The Japanese “R” sound is slightly different from the English “R” The Japanese R sound is said to be a mix between R and L or D. Do not worry too much if you can not get it right away.